UMD has made great gains in the last weeks. Going 3-1-0 against UND and SCSU helps. UMD is currently tied for 3rd in the NCHC with North Dakota and Western Michigan. The Bulldogs can make great strides towards the top with a series at #1 (NCHC) Denver this weekend. 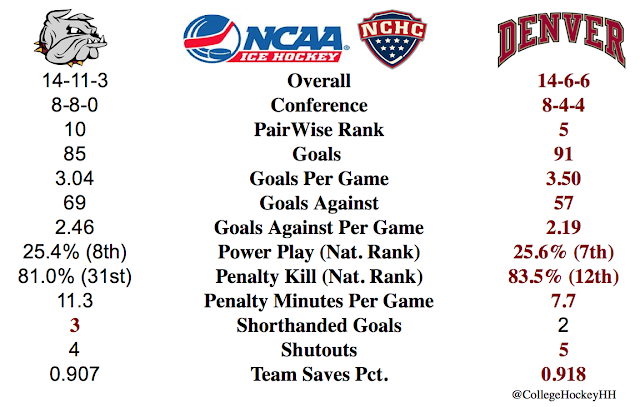 Last time these two teams played, it was a sweep for DU in a pair of low scoring, tight checking, one goal games. This weekend looks to be more of the same, but maybe a different outcome? Both teams are playing well and getting better as the season wears on. UMD is at the end of a challenging stretch of games before a weekend off next. And there is not reprieve with the Olympics. DU star Troy Terry is skating for Denver this weekend before leaving for The Games next week. Looking Forward. After this heavyweight weekend with Denver and the weekend off, the Bulldogs have series three series left. They will be home against a mediocre Miami, at a down trending Western Michigan, and at home against a pesky Omaha team.